Virgin Atlantic has just released a teaser video announcing the Pride Flight from London to NYC in June 2019 to celebrate World Pride. The spot, set in an airport, opens with a voiceover calling “all queens to board the Virgin Pride Flight.” Images of red high heels, that match two-piece suits, consisting of midi skirt and blazer, stepping confidently towards the boarding gate are then seen, along with witnesses staring. Led by actor Tituss Burgess dressed in a pilot suit, the group of women proves to be a group of drag queens. “Oh, you don’t want to miss this flight! Come get fabulous at 30,000 feet,” the Unbreakable Kimmy Schmidt star says, putting then his helmet on. The song used in the ad is the 2018 single “Ice” by DJHF. 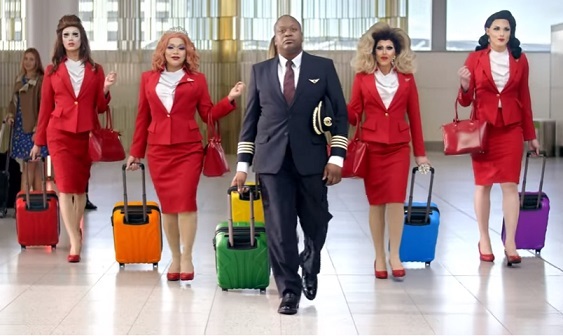 The airline says this will be the UK’s first-ever Pride Flight from London to NYC and invites viewers to join the special flight, which will be hosted by Tituss Burgess and staffed entirely by LGBT pilots and cabin crew. An onboard DJ, performances from Burgess and other “gliterring” guests, inter-seat speed dating are only some of the “ingredients” aimed at turning the flight into an experience to remember. The flight will depart from London Heathrow on the 28th June 2019 to NYC’s Newark airport. The airline announced that a portion of ticket sales will be donated to The Attitude Magazine Foundation to advance community Pride initiatives in the UK.